Last week, I thought about trying to raise $250k in the Pepsi Refresh Project for The Addi and Cassi Fund and for Niemann Pick Type C disease research but being part of something larger that can make a difference for millions of ‘rare kids’ is important to me. That’s why I decided during the entire month of September, I will dedicate my time to raising awareness for all children who suffer from rare diseases and have no treatments or cures in sight. According to the National Institutes of Health (NIH), there are approximately 7,000 different rare diseases affecting approximately 15 million children in the United States. This statistic does not take into account the number of children affected with rare disease in the Europe Union or around the world. According to the FDA, over the past 25 years and since the passing of the Orphan Drug Act in 1983, we’ve had approximately 350 new drugs brought to market for all 7000 rare disorders despite the incentives by the federal government. Think about this for a moment. 7,000 rare conditions. 15 million rare children in the United States. And only 350 new drugs for rare disease in 25 years? These are mind blowing statistics by any measure. 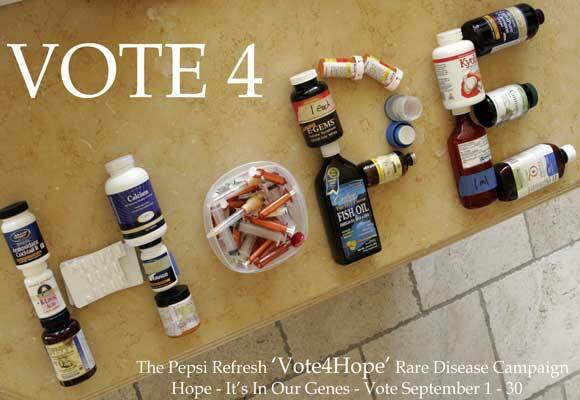 The Pepsi Refresh ‘Vote For Hope’ Rare Disease campaign begins September 1-30 and is designed to drive awareness for the unmet medical needs of the global rare disease community and to encourage pharmaceutical and biotech companies to get more involved in creating treatments for rare diseases. That’s exactly what I want — treatments now for Addi and Cassi and for other kids suffering from debilitating and life threatening conditions such as Batten, Gaucher, Progeria, Cystic Fibrosis, Duchenne Muscular Dystrophy, Fragile X, Williams Syndrome, Canavan disease, Joubert Syndrome, Epidermous Bullosa, Medulloblastoma, Ewing’s Sarcoma, Wilms’ Tumor, Krabbe disease, Pompe disease and Giant Axonal Neuropathy. And that’s only a list of 17 of the 7000 rare conditions affecting children. From rare neurodegenerative disorders to rare cancers to rare bone diseases, parents and families just like mine are all fighting for the same thing for our children – treatments and cures to keep them happy, out of pain, and most of all, alive. Please join me during the month of September and take time out of your day to Vote4Hope at the Pepsi Refresh Project. searcher intent with publisher intent. becoming a member of NOW TELEVISION on-line. This truly shows that there are still folks that care about the things they submit on the internet. I really loved reading through the comments. This truly shows that you can still find people who value what they post on the internet. I truly liked browsing the comments. This truly shows that there are still folks that value what they submit online. I really liked reading through the comments.